Skin concerns, such as discoloration, dullness, blotchiness and dryness can come from a number of different sources. It's hard to find just one product that addresses them all. Garnier Miracle Skin Perfector B.B. Cream immediately and effectively fullfills your skincare expectations with just one multi-benefit product that combines intense moisturizing skincare + immediate skin perfecting coverage for skin that looks naturally more even, radiant and smooth. It’s a new idea in skincare. B.B. Cream (Beauty Balm Cream) is a hybrid formula that offers advanced skincare + immediate skin perfecting coverage in one single beauty product. Gently apply Garnier Miracle Skin Perfector B.B. Cream to face and neck prior to sun exposure for instant coverage and correction as well as for protection. Reapply as needed. Rated 5 out of 5 by Kelly2215 from Disappointed this is discontinued! Just finding out that this product has been discontinued while I was looking to order it online...so disappointing. I loved it so much that I had stocked up on an extra tube quite a while ago but it finally ran out. Please bring this shade back! It is the perfect amount of natural looking coverage for my aging skin! Rated 5 out of 5 by Duckyhawk from Discontinued!! I have tried so many different products and finally found this one! Now I cant buy it anymore... I tried the other one like this but its thick n sticks in my pores.. Hate it.. Really upset that I have to start over trying different ones again...Have a drawer full. Disappointed! What is the reason behind the discontinuing of this product? Rated 1 out of 5 by Tracey W from Miss My BB Cream! 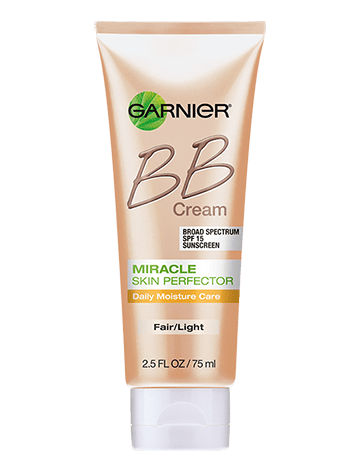 Garnier, please bring back the Miracle Skin Perfector BB in Fair/Light! The new one is much too dark for me! I swear I used to buy one that didn't have SPF in it as I prefer not to have that! I'm so disappointed... I used it for years and never would have bought anything else... I truly miss that product. Rated 5 out of 5 by sammytlewis from Bring back this shade please!!! Every time I wear my BB cream I get so many compliments on my skin, only problem is I have to load up on bronzer because with winter now here I need the lighter shade. Please bring this shade back!! Rated 5 out of 5 by Gina143 from Bring Back the Fair/Light Shade It looks like you discontinued all the fair/light products. That's too bad as the light/medium shade is too dark for my complexion. Rated 5 out of 5 by Posey from Great Product! I love this BB Cream and use it daily. I am disappointed though that i am unable to find the fair/light shade anywhere. Rated 5 out of 5 by Stephany24 from Love it! My skin was very very dry and this bb cream is one of my favorites! The formula left my face so soft and baby like when it had been removed. Also, the color is perfect for my porcelain like skin tone. I also love the fact that its non-condemenic, dermatologist tested, and has sunscreen in it! The formula is fairly thick, so a bit of it goes a long way. 100% positive this is my all time favorite bb cream.